When we listen with open hearts, avoiding response or judgment, we can learn more than we imagined. At the same time, we are giving the gift of unconditional love. Heart and Soul: A Contemplative Worship Service @ 5 p.m. - "What Does It Mean to be a Community of Belonging?" “True belonging is the spiritual practice of believing in and belonging to yourself so deeply that you can share your most authentic self with the world and find sacredness in both being a part of something and standing alone in the wilderness. True belonging doesn’t require you to change who you are; it requires you to be who you are.”- Brene Brown What does it mean to be a community of belonging? When, in your life, have you felt as if you truly belonged? How do you welcome people into your spiritual community? Being a parent is probably the most important and one of the most difficult tasks in any society. How do we nurture and support the parents in our community? Freedom Through Commitment Freedom of choice is great, but TOO much freedom can be paralyzing. Psychologists have shown that more choices don't lead to more happiness, but less. But when we set out to create a life of meaning, rather than just the pursuit of happiness, we can find freedom by eliminating the plethora of choices available and commiting ourselves to things greater than ourselves. In this sermon, we will explore what author Emily Esfahani Smith calls "the 4 Pillars of Meaning." Please join us for a take home message TBD from our late winter "BYOT-Ethics Meets the Fifth UU Principle" group. Darwin, Natural Faith, and the New Story Darwin's legacy transformed modern scientific understanding *and* liberal religion, upending prior certainties that were thousands of years old; and both challenging and expanding concepts of god(s) and the divine. Emerson and Thoreau, Transcendentalists who came out of the Unitarian tradition, had already helped to kindle a new ethic of interconnectedness with nature, and they accepted Darwin's work when it was shocking and brand new. But it’s still shocking today. Evolution is accepted scientific fact, but a significantly large (nearly half, according to surveys) number of people in our country still don’t accept it. Why are science and religon still so often at war? As Unitarian Universalists, are we attuned to the New Story that is emerging? Heart and Soul: A Contemplative Worship Service @ 5 p.m. - "What Does It Mean to be a Community of Freedom?" Heart & Soul is a contemplative worship service series that occurs on the second Sunday of each month. It is a shorter, more intimate service, with singing and instrumental music, statements, and questions, silence, and sharing. Readings, poems, quotes, and music are drawn from a variety of sources, including the UU Soul Matters Sharing Circle, our hymnals, and popular/folk music. Lu Xun says, "Hope can be neither affirmed nor denied. 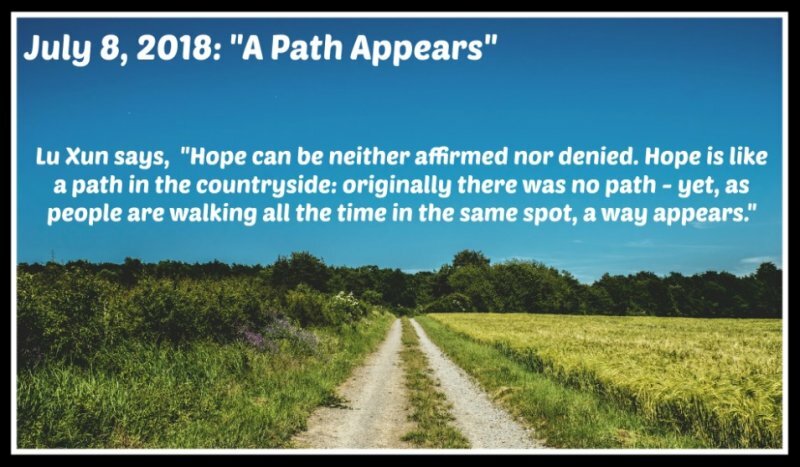 Hope is like a path in the countryside: originally there was no path—yet, as people are walking all the time in the same spot, a way appears." The Unitarian Universalist Church calls us to take action in the world to live out our Seven Priciples. How do we approach change in a process-oriented way that we can sustain so that a path appears for us and for others? The Rev. Dr. Martin Luther King Jr. taught non-violence as a philosophy, a spiritual practice, and a strategy. A key principle was that "nonviolence seeks to defeat injustice, not people." Activists often overlook the final step of the King strategy, which is reconciliation. How do we practice Kingian nonviolence in all parts of our lives?